Find out what is and isn’t in your drinking water with a home water test kit. Whether you own a home or rent, have well or city water, it’s a smart step to take and this kit makes the process easy. It identifies 15 different contaminants including bacteria like E. Coli, metals like iron and zinc, chlorine and more. It’s a straightforward and simple test that gives you quick results right at home. 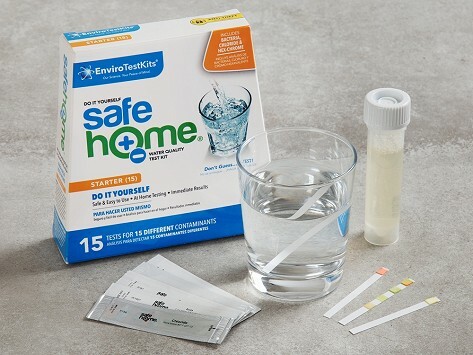 Dimensions (in packaging): 18.25" x 6.5" x 6.75"
The home water test kits made by Safe Home® EnviroTestKits are backed by the larger Environmental Labs Inc. This group is one of the largest labs in North America and has been testing water quality for over thirty years. Founder Chris Myers and his team wanted to make it simpler for folks to do the testing themselves, so their kits are straightforward, easy to complete, and provide quick results—all at home and without needing to send water samples to a lab. There are different tests to pinpoint different potential contaminants, like lead and metals, bacteria like E. Coli, pesticides, and also to determine pH and alkalinity levels. No matter where you live, or if your home has well or city water, it’s a smart move to test the drinking water. And Safe Home® EnviroTestKits is happy to help answer questions or provide you with next steps.